Although people often refer to a thoracic disc herniation as a slipped disc, the disc doesn't actually slip out of place. 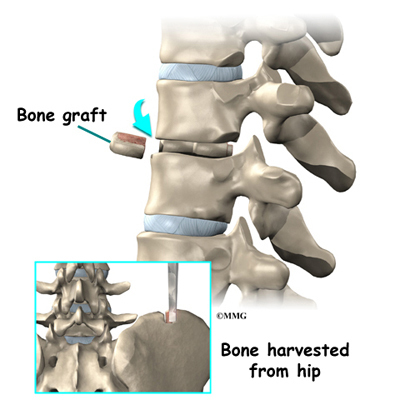 Rather, the term herniation means that the material in the center of the disc has squeezed out of the normal space. 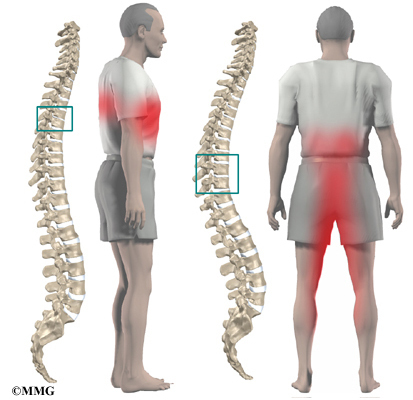 In the thoracic spine, this condition mostly affects people between 40 and 60 years old. The intervertebral disc is a specialized connective tissue structure that separates the vertebral bodies. The disc is made of two parts. The center, called the nucleus, is spongy. It provides most of the disc's ability to absorb shock. The nucleus is held in place by the annulus, a series of ligament rings surrounding it. Ligaments are strong connective tissues that attach bones to other bones. 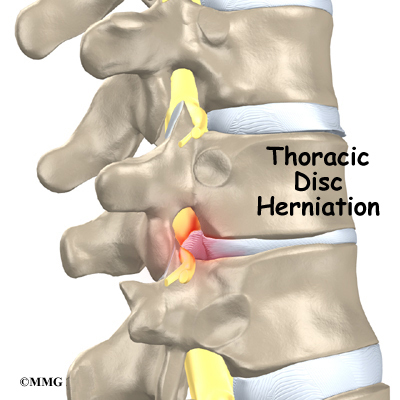 Thoracic disc herniations are mainly caused by wear and tear in the disc. This wear and tear is known as degeneration. As a disc's annulus ages, it tends to crack and tear. These injuries are repaired with scar tissue. Over time the annulus weakens, and the nucleus may squeeze (herniate) through the damaged annulus. Spine degeneration is common in T11 and T12. T12 is where the thoracic and lumbar spine meet. This link is subject to forces from daily activity, such as bending and twisting, which lead to degeneration. Not surprisingly, most thoracic disc herniations occur in this area. Diseases of the thoracic spine may lead to thoracic disc herniation. Patients with Scheuermann's disease, for example, are more likely to suffer thoracic disc herniations. It appears these patients often have more than one herniated disc, though the evidence is not conclusive. X-rays show the bones. They normally don't show the discs, unless one or more of the discs have calcified. This is significant in the diagnosis of thoracic disc herniation. A calcified disc that appears on X-ray to poke into the spinal canal is a fairly reliable sign that the disc has herniated. It isn't clear why a problem thoracic disc sometimes hardens from calcification, though past injury of the disc is one possibility. Computed tomography (CT scan) may be ordered. This is a detailed X-ray that lets doctors see the body's tissue in images that also look like slices. The images provide more information about calcified discs. 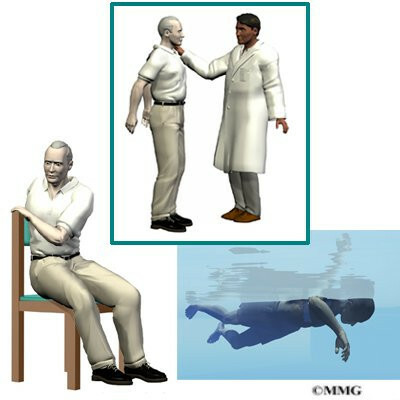 Doctors may combine the CT scan with myelography. When the CT scan is performed, the myelography dye highlights the spinal cord and nerves. The dye can improve the accuracy of a standard CT scan for diagnosing a herniated thoracic disc. Surgeons may recommend surgery if patients aren't getting better with nonsurgical treatment, or if the problem is becoming more severe. When there are signs that the herniated disc is affecting the spinal cord, surgery may be required, sometimes right away. The signs surgeons watch for when reaching this decision include weakening in the arm or leg muscles, pain that won't ease up, and problems with the bowels or bladder. Even if you don't need surgery, your doctor may recommend that you work with a physical therapist. Patients are normally seen a few times each week for four to six weeks.